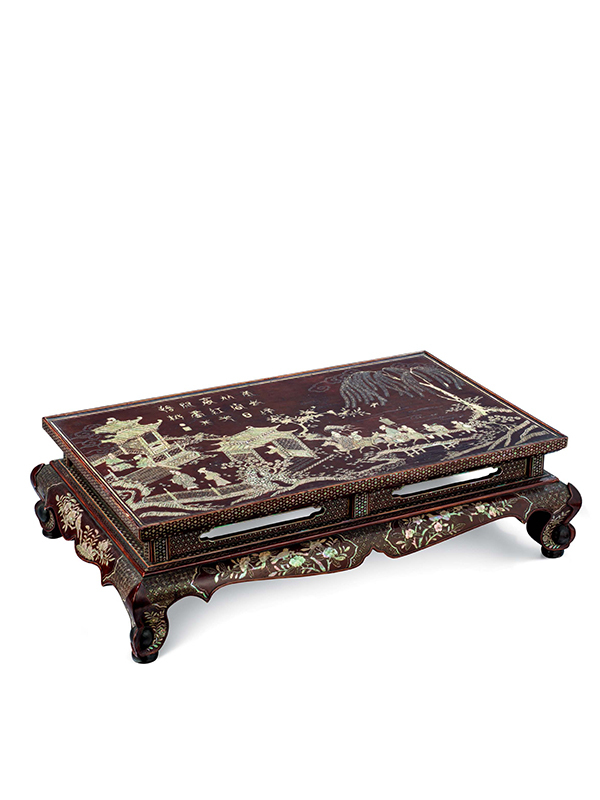 A rectangular lacquer kang table, inlaid in mother of pearl. The kang table is of conventional form with a flat top and a recessed galleried section with a lobed apron below. The table is supported on four short cabriole legs ending in curled feet with black painted spheres and circular pad feet. The table is inlaid all over with minute pieces of mother of pearl against a pale brown background. 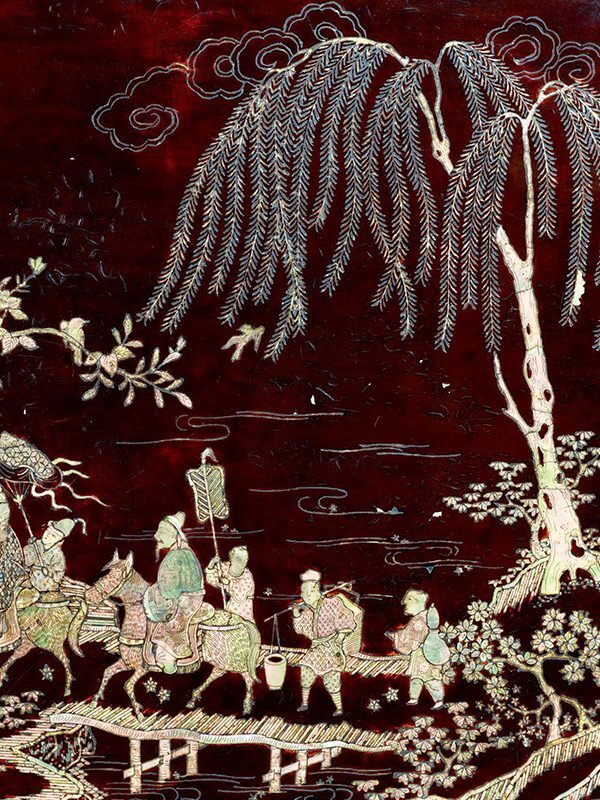 The flat top is decorated with a landscape design depicting eleven figures, two of which are on horseback, in the shade of a weeping willow tree. Four boys carrying respectively a gourd, a yoke with a picnic basket and a pail, a large fan and an umbrella crowd around the riders. The group crosses a bridge and moves towards a pavilion partly obscured by clouds. The doors of the roofed entrance gate have been opened by a servant, who holds out his hand in a welcoming gesture. Two figures sit beside a raised pavilion, one playing a qin whilst the other kneels before him and looks on. In the garden two further figures are having a conversation. All the figures are dressed in long belted robes, each one finely decorated with different patterns in minute pieces of mother of pearl. At the top of the scene in the centre is a 14-character inscription, reminiscent of archaic script. The sloping apron of the table is decorated with six shaped cartouches, depicting birds on flowering camellia or peony branches. The legs are decorated with floral and leaf designs. The table is contained in a Japanese wooden box. 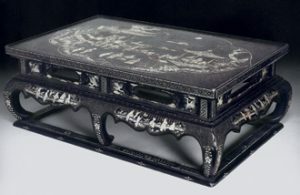 Lacquer furniture inlaid with mother-of-pearl is first mentioned in Song dynasty texts, such as the 12th century Record of Important Events, which reports that pieces of mother-of-pearl inlaid furniture from Wenzhou and Hangzhou were among a group of ceremonial objects sent to the emperor by the prefect of Zhenjiang. The scene on the top of this kang table was most probably inspired by an illustration accompanying a novel such as the Yuan dynasty “Romance of the Western Chamber” (Xixiang ji), which relates the story of the young scholar Zhang Sheng, who went to the capital to take the highest imperial examination. The scene appears to depict the return of Zhang Sheng after the successful completion of his examination. The inscription on the present table is a poem written in characters that are reminiscent of archaic seal script, but are in fact legible Chinese characters. The name of the poem, ‘Spring Poetry’ written by Shih Jian-Wu (780 – 861) of the Tang dynasty, refers to blossoming plum trees, singing birds and cloud patterns in the sky, all of which are represented in the decorative motifs. A slightly smaller kang table of practically identical form inlaid with a design of prunus flowers is in the Muwen Tang collection. Kwan dates this table to the Yuan period (1279 – 1368). Another comparable kang table in the Muwentang collection is dated to the Ming dynasty; it is supported on six legs and depicts a similar decorative scheme of figures within a landscape setting with buildings (fig. 1). A further comparable later example dated to the mid-Qing dynasty, with simpler construction and decorated with a scene of plum blossoms and birds on the surface, is in the collection of the Palace Museum, Beijing.